At Audi Wyoming Valley, we know how to keep our customers happy. If you’re looking for an awesome car that can provide you with a great commute, then look no further than an Audi A3 Sportback e-tron. It’s the least expensive Audi hybrid model and provides technological aspects that make driving easier. Want a feature that tells you if you’re getting close to lanes? This Audi has you covered. With Audi active lane assist, the camera that is mounted on the car analyzes lane markings and siphons that data into an advanced processing software. What about a center display? Audi’s MMI center display with handwriting-recognition technology can help you access your driver assistance features and make your drive as smooth as possible. 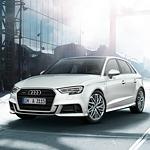 If you want a reliable car, then look no further than an Audi. With a variety of cool technological features, you can customize the car any way you like.